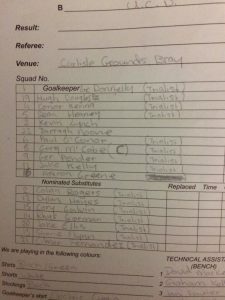 This match was a chance for a first look at Players for both sides before the start of the SSE Airtricity League season which begins in February. 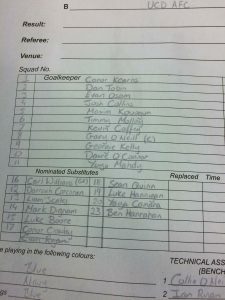 UCD starting lineup was a healthy looking list with familiar names from last season first team and U19s. 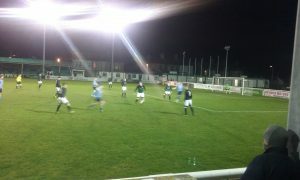 The home side also contained a strong list including ex-UCD Conor Kenna, Hughie Douglas and Paul O’Conor. But all Players who had signed a fresh contract (re-newed or close season signing) were noted as a Trialist on the starting lineup. Bray sources felt this was because the new contracts needed ratification from the FAI. But it didn’t stop the Football Match taking place. Both sides started smartly playing short passes their respective defences and midfield. Bray had one foray upfield which resulted in a corner but nothing came of it. Daire O’Connor was making long striding runs at the Bray defence. The Students best chance came around 15 minutes a ball from midfield out wide right was controlled by Kevin Coffey he held off the strong attentions of his marker, broke free and out paced him so fire a wicked shot that Eric Donnelly had to change his footing to stretch behind him and push the ball onto the post which was then cleared. Bray had their own chances after that with Darragh Noone, Paul O’Conor and Hughie Douglas at the centre of many of their moves. But the Student defence stood up to their threats. Unfortunately, UCD left back Evan Osam was barreled over and after a minute attention had to limp off replaced by Liam Scales. 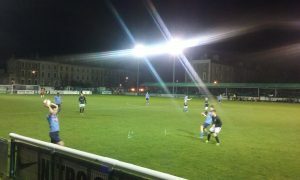 UCD started to get control of possession and pressure the Bray penalty area. Captain Gary O’Neill sent over a couple of free kicks that were dealt with by the home defence. (Gary O’Neill (c) sends over a first half free). During the interval UCD AFC’s new Assistant Manager Ian Ryan put the substitutes through their paces in some intense drills. Well some of them didn’t have to wait long as 6 of them came on the pitch at the start of the second half, including goalkeeper Carl Williams. The team still held their competitiveness from the first half, as Bray then changed players midway through the half and UCD added more subs the game started to slow and moved towards the final whistle. It was a great accomplished performance in the squad’s first match back after close season. Beautiful passing movements and controlling a large part of the second part of the first half. The one downside is waiting on the diagnosis and prognosis on Evan’s injury. Bray Wanderers (starting lineup): Eric Donnelly, Hughie Douglas, Conor Kenna, Sean Heaney, Conor Lynch, Daragh Noone, Paul O’Conor, Gary McCabe, Ger Pender, Jake Kelly (Cory Galvin HT), Aaron Greene. 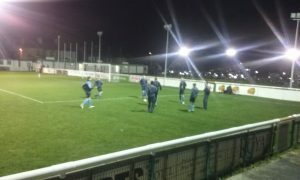 Subs bench: Calvin Rogers, Dylan Hayes, Rhys Gorman, Jake Ellis, Shane Flynn, Cilmar Fernandez.